Indian online retailer, Flipkart is putting the OnePlus 3 up for sale at just Rs 18,999. But there’s a catch to this deal and it isn’t really a pleasant surprise either. OnePlus will not offer any warranty with the Flipkart purchase. OnePlus has confirmed that purchasing the device from any non-Amazon channel will not come with warranty. This looks to be the second problem OnePlus has run into with sales in the Indian Subcontinent, with the first being with Cyanogen OS. 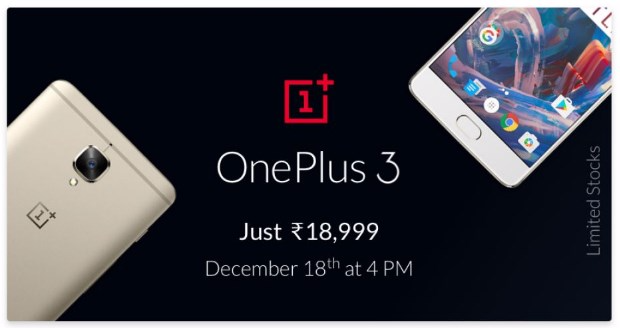 But it’s hardly surprising either — as OnePlus has an exclusive agreement with Amazon to sell its products in India, where they are selling OnePlus 3T right now. The OnePlus 3T — an upgrade on OnePlus 3 — with the Snapdragon 821 chipset offers better performance increase over the OnePlus 3, and improves on camera and battery. Talking about the OnePlus 3, it is now beta testing Nougat with OxygenOS Open Beta 9. Regarding the 3T, the device is now receiving an update to Oxygen OS 3.5.4 including performance and stability improvements. The 3T may also be in line for a direct update to Nougat without the need for a beta test.